Android Police rarely issues any kind of directive not to purchase a particular product. Recent news around the Galaxy Note7 is what I would deem cause for us to now do so. It's not because of our sincere desire for your safety so much as what the chaos around the Note brand right now means for owners of the Note7 down the road. Currently, AT&T, the US's largest (or second-largest, depending on the quarter) mobile operator, is actively seeding discussion about dropping the Galaxy Note7 entirely. There is no doubt in my mind that the other "big three" US operators are currently having similar talks. Of course they are. All four carriers are allowing customers with "safe" Note7 devices to return them. And operators and retailers around the world are likely considering doing the same. Even if it isn't their product, they're being associated with the "exploding Samsung." Who wants their brand to be coupled with discussion about spontaneously combusting phones? This is extremely bad news for Samsung, but it's also, I would argue, not great news for Note7 owners who may go their entire device lives without any sort of spontaneous device conflagration. It's bad news because it may mean, if the Note7 does go into full retail death, that Samsung will allocate resources away from supporting it in the future. While the Galaxy Note7 could go on to live a typical software support life in Samsung terms, there's a very real possibility now that Samsung will attempt to cut its losses. Issues may go unfixed, or linger for unusually long, and major OS upgrades could see delays. Here in the US, especially, what motivation do you think the big carriers will have to expedite update certifications for the Note7? All they're going to see is a lost cause. You may also be subject to the attention of annoyed flight attendants for months and, possibly, years to come. Could the FAA just decide to up and ban Galaxy Note7s from planes? I wouldn't say it's likely, or even very enforceable, but who's to say they wouldn't try? Not to speak of various airlines and other international air regulatory bodies. Your phone's resale value on the open market will almost certainly suffer, too. 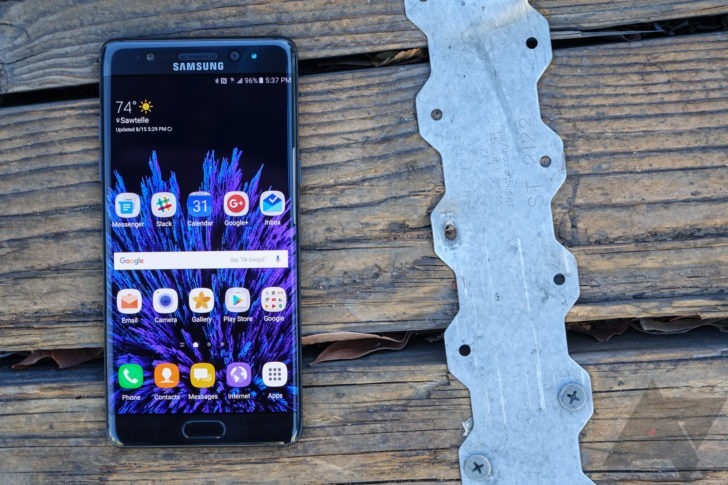 It will be forever known as "the exploding one," even if investigations into the now two claimed fires of 'safe' Note7 units end up being a case of mistaken identity or fraud. It doesn't matter. The damage is done. If you have a Galaxy Note7, I would strongly advise you to return it for a refund or exchange it for this reason alone if you can - it's just economic common sense. Of course, many people will hold onto their phones, and I'm not saying that's foolish - just that there are very good reasons not to. There is massive uncertainty about the future of this device at the moment, and even in the event things go better than expected, I still believe strongly that this episode is going to have a huge impact on Samsung's brand. It's quite possible we're witnessing the death of the 'Note' name right now. So, if you have friends or family considering the Note7, or unsure about whether to return or exchange the one they now I have, I would strongly advise them to consider another device (we're not picking favorites, this is strictly a PSA) or to get rid of the Note7 they now own. AT&T and T-Mobile have both issued stop sale orders for the Galaxy Note7, and will no longer provide replacement devices to those affected by the recall - you must return your phone or exchange it for a different one. Two new cases of replacement devices catching fire in the US have emerged. In one, a man's replacement Note7 caught fire in his bedroom overnight, filling the room with smoke. He had to be treated at a hospital for smoke inhalation. Return your Note7.